Without a doubt, the highlight of my first visit to San Francisco was seeing (and then crossing) the Golden Gate Bridge. As famous architectural icons go, it stands with the Taj Mahal, The Empire State Building, The Statue of Liberty, The Eiffel Tower, and Sydney Opera House. Not only that, the Golden Gate Bridge is an authentic color blindness test. You see, I could have sworn that the Golden Gate Bridge was red. In every photograph of it, scene in a movie, or opening TV credits of a San Francisco based sit-com or drama, the Golden Gate Bridge looks red to me…but no, it is apparently orange. 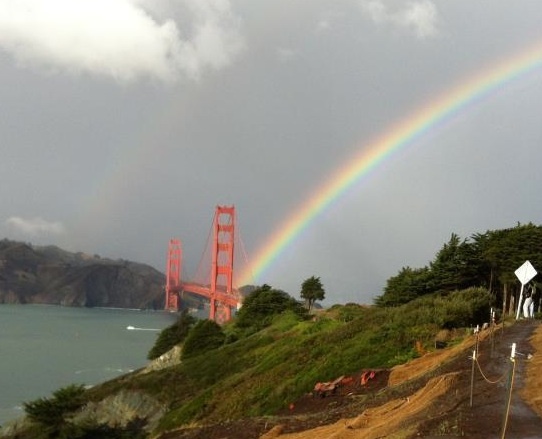 A pot of Golden Gate Bridge sits at the end of this rainbow. I was told/misinformed that there was one man whose single job responsibility was to paint the illustrious bridge. He starts painting at one end, and by the time he gets across to the other side of the bridge, effectively finishing the job, it’s time to repaint the thing all over again. The painter’s name is Frank, and he is responsible for making sure that the bridge stays its famous color, which is apparently called International Orange. When I heard of this, I told anyone that would listen that the Golden Gate Bridge was red, and I would not hear of it being referred to as orange—International or otherwise. When I first traversed the bridge, it was near sunset and I wondered whether Frank the lone painter was still at work. Perhaps he was hoping to finish just one more little stretch of column before calling it a day. I imagined the monotony of such a lonely profession. What did he think about, day in and day out? When he closed his eyes at night, did he see that same red-orange color? Maybe he dreamed about coming into work and painting the bridge a different international color. I wondered how much of the bridge he could get painted before his boss, or the Five O’clock News, caught wind of his little game? I imagined Frank going into the paint store holding a small book of color swatches, which yesterday—perched on top of the Golden Gate Bridge—he had held up against the San Francisco skyline. “Ten thousand gallons of the usual today, Frank?” the paint store manager asked, happy to see his best customer. “Ooh, not ten thousand gallons, I’d have to special order that,” said the manager. “I could try. Say—you’re not planning on painting the Golden Gate Bridge turquoise, are you?” asked the manager suspiciously. “That’s fine,” said Frank. He nervously opened his wallet and placed his credit card on the counter. The manager picked up the card, and the two men silently waited for the transaction to process. Frank scratched a larger fleck of International Orange paint off of his dark blue overalls. The payment came through, Frank signed the credit card slip and left the store. The painter jumped into his truck and drove off. As soon as the store manager saw the truck was out of sight, he picked up the phone. Happy Birthday, Golden Gate Bridge, the Bay Area would be a lot less awesome without you. So I was going to check out the solar eclipse yesterday afternoon, but you know I was in a bar at a show in a windowless venue, and this solar eclipse nonsense was happening, and it was like ALL the way outside. “I suppose I’d better go and check it out,” I said to no one in particular, and I started to get up off of my seat to go, but right at that very moment, my attention span was distracted by a song, or was it a pretty girl, or maybe it was just those floaty things that move around under the surface of your eyeballs when you’re not really looking anywhere. Either way, I missed the eclipse because of a combination of laziness and a terrible attention span. It all started at a young age, the teacher would be prattling on about what causes a solar eclipse and what Isaac Newton, Britain’s most famous astronomer, wrote about them, and I’d be thinking about a song, or a pretty girl, or mentally chasing those floaty things under my eyeballs. Or maybe my mind would just go off on an unexplainable one minute tangent. Huh…an apple?…that’s weird…lucky he wasn’t sitting under a cherry tree. He wouldn’t have even felt the little berry hit his head because of those big gray wigs that they wore in those days. He would have just had this bright red cherry sticking out of his wig like a traffic light indicating STOP! in a thick fog. No one would have said anything to him about his cherry wig accessory to embarrass him, because he was a really famous physicist and astronomer—except that he wasn’t, because he SHOULD have been under a tree whose fruit bore a little weight, like a grapefruit or a coconut, although that might have hurt. Could you imagine if a coconut hit him? He might have got a concussion or worse—instant death. Then we’d still be without this whole gravity thing sorted out; maybe we’d have to wear moon boots like the astronauts. I wonder if Newton ate the noggin-bruised apple. Or did he run home clasping the fruit in his hand so that he wouldn’t forget what principle it was that he discovered? Maybe Newton kept the apple like it was a trophy awarded for his genius. How long would it be before the fruit decomposed and became an eyesore? “Oh God, he’s getting the apple out again…Yes, yes, gravity, we’ve heard it,” Mrs. Newton would groan. 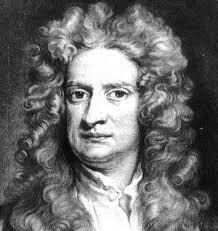 Did it irritate Mrs. Newton that her husband was a genius? He must have been right about everything. I think being right about everything would be brilliant. For one thing, you’d be rich. You’d win the lottery because you’d know all the numbers. I think if I were rich I’d keep all my money in a big room in a mansion I bought with my winnings. I would make sure that I didn’t have large denominations, though, just small ones to make it look like I had even more money, like the old One Pound notes that they had in England before they changed to the Pound coins. Why would you have a Ten-Pound note when you could have ten One Pound notes? The One Pound notes were the best. 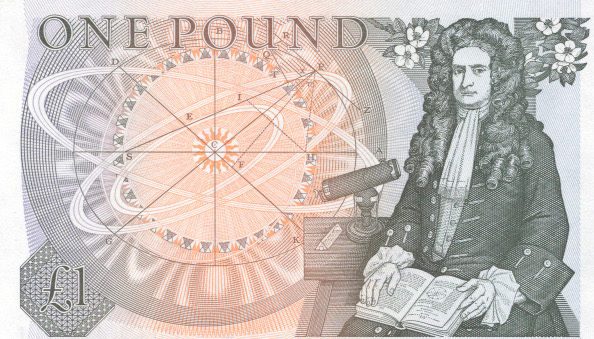 What was the name of that famous English physicist and astronomer pictured on the One Pound note? I know. It must be some sort of typo, right? I’m assuming all of these special days are slightly less celebrated than say Christmas or a Birthday. 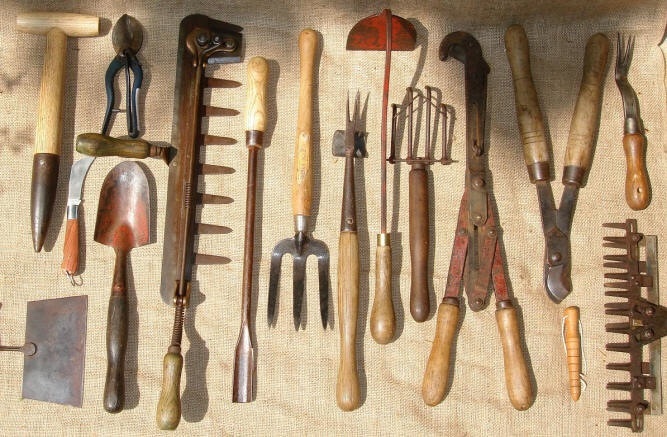 The tools, although loosely based on primitive man’s first efforts to till the soil, also closely resemble devices of torture utilized in a Medieval Spanish dungeon. So why, oh why would you have these implements of injury anywhere near you while you are naked? It’s bad enough that roses have thorns, but have you ever seen or held a pair of pruning shears? I mean, seriously! Exposing your body to the dangers of Medieval weaponry and thorny plants is bad enough, but for good measure, let’s throw in the possibility of being stung on your naughty bits by a bee, or bitten by a few mosquitoes. There isn’t an insect repellent in the world that could be strong enough to make me mow the lawn wearing nothing but a cheerful smile. You think a bug spray called “OFF” is going to cut it? I’m just wondering, do these hairy horticulturists wear gardening gloves? Yeah, hippy, for Christ’s sake, be sure to glove and protect those precious green thumbs. Oh, and while you’re pruning the roses don’t forget to trim that bush. And if a talented gardener has “green thumbs” what does a talented naked gardener possess? Surely something that sounds like a dose of penicillin or a biotic (of the anti variety) might be in order. Or is modern medicine a second-rate tonic? Can’t we just go all Medieval and use a weed whacker? And on what day should that fall? Happy World Naked Gardening Day!!! !